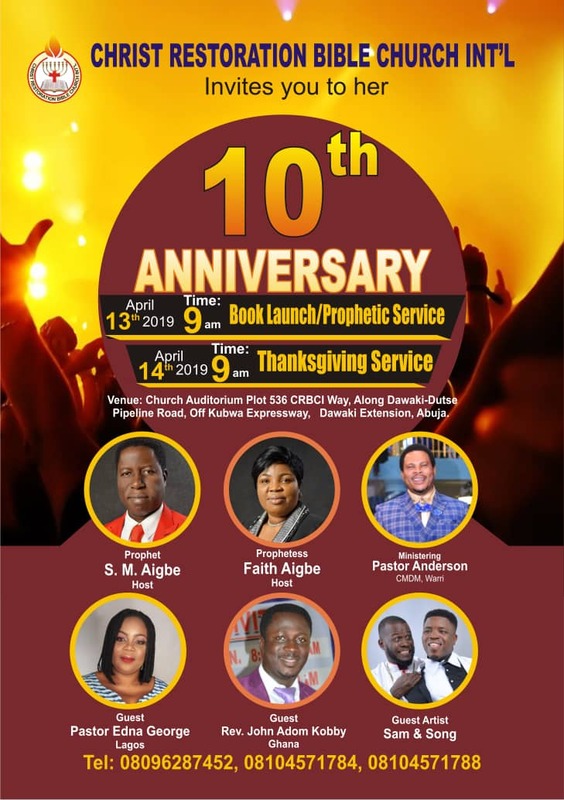 Christ Restoration Bible Church International - CRBCI is inviting the general public to the celebration of their 10th anniversary which will witness a Book Launch/Prophetic Service on the 13th of April and Thanksgiving Service on 14th at the headquarters in Abuja Nigeria. 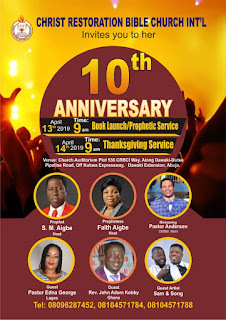 The 10th anniversary celebration ceremony will be hosted by the general overseer, Prohet S.M Aigbe and Prophetess Faith Aigbe at the Church Auditorium, along Dawaki, Dutse in a glamourous event that has been well prepared for. The occasion will be having the distinguished powerful ministration by Pastor Anderson from CMDM Warri, alongside side other specially invited guests which includes Pastor Edna George from Lagos, Rev. John Adom Lobby from Ghana and the performing Guest Artist, Sam & Song. The Prophetic grace upon the church has been expediently visible, testimonial and dynamic is the last 10years of it's establishment. Prophet S.M Aigbe and his wife Prophetess Faith Aigbe has remained committed to the faith, especially with their grace of life changing testimonies for members of CRBCI across the world. Members from across all branches will be celebrating this significant day of the church, as it has continued to record growth in all areas. According to one of it's members during a cross session with our correspondence, he told us that, since he joined the Commission in 2014, his life has never been the same and everyone he introduces has remained under the prophetic power of the church with countless reception of Testimonies and miracles in their lives. He appreciated the prophet and his wife and prayed that Christ Restoration Bible Church International will continue to record acceleration in all it's endeavours as it celebrates her 10th Anniversary.